Throughout history, artists have used the grotesque to express disharmony, both personal and political. But does it still provide a mirror for conflict in our own society? Ben Lear went along to The Art Corner to find out. What is the grotesque and what, as this exhibition’s title suggests, propels the twin feelings of desire and repulsion it can evoke? As well as tackling this question, Desires and Repulsion: Grotesqueries, seeks to use the grotesque as a mechanism for social commentary. The exhibition brings together the work of twenty handpicked artists who explore these ideas using sculpture, screen printing, photography, and interesting approaches to traditional painted works. Many of the pieces provoke visceral responses; artwork bulges towards the audience and materials are attached to the canvas in order to disrupt the idea of traditional two-dimensional work. The pieces on display explore several overarching themes. A common one is that of ‘nature’ and ‘natural’ objects. A good example of this is Peter McCarthy’s seemingly Brothers Grimm inspired The Stranger in the Wood, which features the titular masked stranger in an eerie woodland scene. Often seen in horror films, the transformational power of, and human unease with, nature is evoked here to good effect. Inspired by nature itself, these pieces demonstrate that as well as being unsettling, the grotesque can be as beautiful as that which is traditionally considered aesthetically pleasing. Many of the pieces are successful feminist commentaries which highlight the grotesque in society’s gender relations. Grimes and Jones’s Man and Wife depicts a husband and wife as representations of their respective genitalia. The scrawled messages of “in sickness and in health” and “too much dinner” amplify the social meaning of the work. Sue Shaw’s Peek is a screen-printed meditation on the youth-orientated nature of commercialised feminine beauty; the repeated pattern of an ageing woman’s face is distorted to such a degree as to not look out of place on an Aphex Twin front cover. However, the most powerful of these pieces, and in my opinion the strongest piece in the whole exhibition, is Victoria Lewis’s Menonpause which explores the artist’s own anxieties surrounding the menopause. The piece, which features two female figures made of hessian emerging from a destroyed mattress, prompts questions about fertility, age and self-identity. The deliberately exaggerated nature of the two sculptures creates an unsettling feeling for the viewer. Thus the grotesque can be used as a mirror to reflect the inherent ugliness within society and, as such, it is a useful vehicle for discussing social and political issues. This collection has found a suitable home in the shabby chic of The Art Corner. This space certainly doesn’t conform to the popular image of art spaces as sleek, crisp and minimal with holes in the ceiling and dodgy floor boards blending seamlessly with site-specific art made by Sue Patterson. Unfortunately, this will be the last exhibition at this current space; The Art Corner is soon to be converted into a live music venue. The team behind the gallery has also curated a collection by Ashes57, an influential artist within the dubstep world, and Cuts and Grazes, a collection focusing on the economic cuts. They will now be looking for a new space to continue their work. 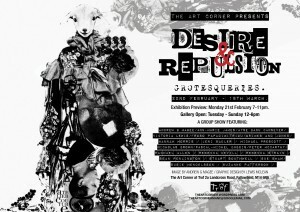 Desires and Repulsion: Grotesqueries is running at The Art Corner until March 18 2011.